California plays a central role in America’s defense. The state provides unique, mission-critical capabilities for the military that need to be preserved and indeed strengthened if America is to maintain its position of leadership in a rapidly changing world. Home to the world’s most valuable network of air, sea and land ranges, California’s military installations have prepared generations of American service members for conflicts around the world and provide a critical staging ground for current actions. California’s defense infrastructure provides the essential ingredients necessary to transform and strengthen national military power for the new century. There are more than 30 major defense installations in California, incorporating all military services, more than double any other state. California’s diverse network of training ranges are a national treasure that cannot be replicated or replaced. Each of these bases has unique, important military value, and each is making critical contributions to national security, today and for the future. California is the strategic gateway to Asia and the Pacific, the increasingly important area of growing economic and military might in the 21st century. California provides superior technology, critical facilities for joint training and operations, and the keys to effective and efficient force projection in the future. California is therefore uniquely suited to provide the human and physical infrastructure needed to meet the probable threats of the coming decades and ensure America’s pre-eminent role in world security. 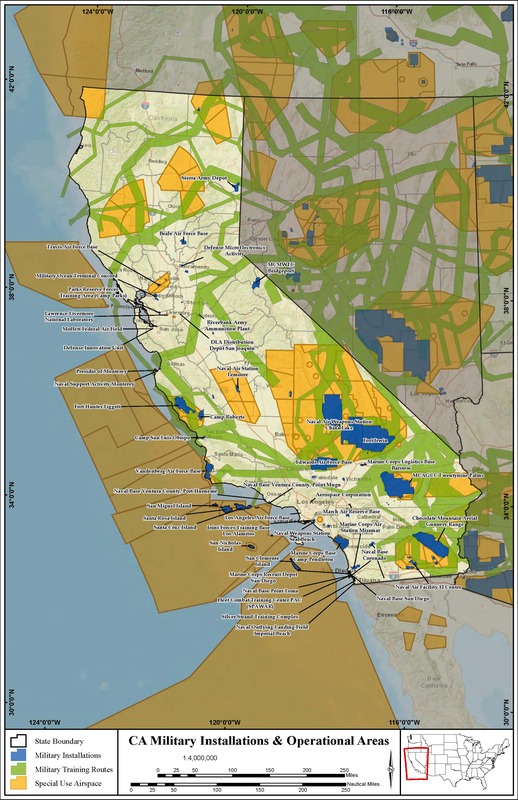 California possesses a unique combination of irreplaceable assets: weather, climate, terrain, available space on land and sea and in the air, and the people, buildings, and equipment to use those assets full time. California’s unique value lies in the interconnectedness and close proximity of its large unencroached military desert lands and nearby mountainous terrain, the largest restricted airspace in the continental United States, and extensive deepwater operating areas off its coast. California provides the best opportunities for joint training and operations in the continental United States. California’s unmatched assets enable the Army, Navy, Air Force, and Marine Corps to combine capabilities and leverage the operational capabilities of the total force, with Reserve and National Guard units comparable to their active duty counterparts. California offers the best combination of technology, industry, and academia in support of military needs, for today and the future. In addition to the Naval Postgraduate School, seven of the top 25 research universities are in California, and they all provide critical contributions to national security. America’s best-trained and most-experienced aerospace and technology workforce lives and works here and is committed to staying and supporting military requirements. It will be impossible to move that workforce and still maintain its superiority. California has the largest combination of operational bases, training space, and support activities for meeting defense needs today and for the foreseeable future. This unique complex is and will continue to be critical to America’s defense in the 21st century. A list and short description of each of the many military installations in the state, as well as a map depicting their locations. This page provides links to information and reports detailing the beneficial economic impact that military installations have on their surrounding communities and regions. This Handbook represents a flexible planning guide and toolbox that can be applied in a variety of ways to meet the unique needs of each stakeholder as they pursue and achieve land use compatibility community and military planning.